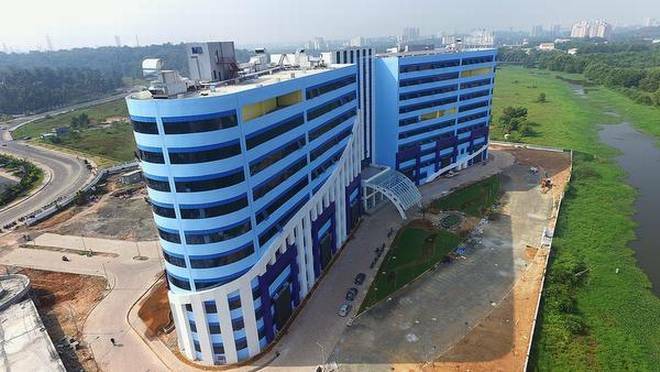 The first IT building constructed as part of the second stage of Infopark expansion will be launched by Chief Minister Pinarayi Vijayan at 11 a.m. on Sunday. Named ‘Jyothirmaya’, the building has a built-up space of four lakh sq.ft., plus some 1.5 lakh sq.ft. area for parking and amenities such as banks, ATMs, and food courts. It is located over six acres of the total 102 acres of notified Special Economic Zone (SEZ) on the Phase-II campus. It is also the first multi-tenanted IT building on the Phase-II campus and is expected to provide employment opportunities to around 4,000 IT professionals. The Phase-II campus is coming up over an area of 160 acres spread across Puthencruz and Kunnathunad villages and is envisaged as a ‘walk to work’ IT township with built-up space for IT companies and facilities like business convention centre, budget hotel, shopping complex, school, and hospital. The initial development, however, is over an area of 125 acres, with construction undertaken in accordance with the green protocol. Infopark CEO Hrishikesh Nair told the media here on Thursday that around 85% of space available had already been hired by 15 companies. “The campus with water frontage to Kadamprayar river will have a total built-up area of 8 million sq.ft. when it is fully operational with direct employment opportunities for 80,000 IT professionals.” Mr. Nair said. “Now, people can come to work on a boat through the Kadamprayar river, and it is one of the key highlights of the building. The boat service is at present available from the Vyttila Mobility Hub to Rajagiri, and the corporation is planning to extend the service to Phase-II soon. The Kochi metro is also expected to be extended to Kakkanad in its second phase, and with the Seaport Airport Link, Infopark will be well connected and easy to commute for those who work here,” he added.